Amid a day of new hardware and software reveals from Apple, the company also announced the launch of Monument Valley 2, which is out now exclusively on the iOS App Store for $4.99 [Direct Link]. 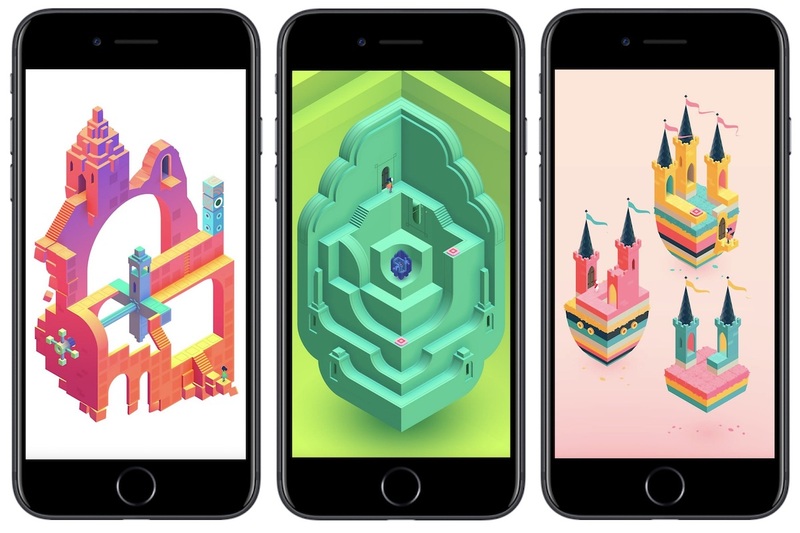 Released by ustwo Games, Monument Valley 2 is the sequel to the popular 2014 iOS game Monument Valley, which tasked players with navigating a princess through a series of increasingly difficult optical illusion mazes. According to the developer, Monument Valley 2 follows in its predecessor's footsteps with all-new levels that are "filled with illusory, meditative puzzles," but this time players are guiding a mother, named Ro, and her child through the game's puzzles. Ustwo Games notes that knowledge of the original game isn't needed to enjoy the sequel, but the two games are set in the same universe. Dan Gray, head of studio at ustwo Games says, "We wanted to find the perfect reason to return to Monument Valley, and the story of a mother who's not only a parent but a creator of this world is a narrative we felt compelled to tell. We spent two years hiring some of the industry's most talented people for this team, and we're excited to show this whole new take on a game fans have been asking for." A standalone adventure - A completely new story from the Monument Valley universe. You don’t need to have previously played Monument Valley to enjoy Monument Valley 2. Individually crafted puzzles - Enjoy beautiful levels filled with illusory, meditative puzzles, using brand new interactions to explore the changing dynamics between characters. Contemporary visuals - Artwork inspired by an eclectic mixture of architectural styles, artistic movements and personal influences, each translated into stunning geometric structures. Beautiful audio - Immerse yourself in uniquely melodic interactive soundscapes, tailored perfectly to every step of Ro and her child's journey. Instant buy. These guys deserve every penny (and kudos to them for resisting the freemium temptation). Could I download the app store on my android phone? Purchase one of the devices at that link. It will come with the App Store already installed. Open it on that device and then open an App Store account and you will be able to download any apps from the store to the device that you purchased from the above link. Favorite game of the last 10 years. Would love #2 on AppleTV! Too easy, nothing really new, too expensive and too short. 2 years after the 1st excellent game, I was expecting something much better. I didn't get stuck at all, didn't have to think much and was completed in an hour. The crow people didn't even make a comeback. I think the phoned it in because they knew it would sell because of the strength of the 1st game. I don't play games. This is the exception. It's just beautiful and mesmerising. Reminds me a little bit of the psychedelic 60's and films like "Yellow Submarine"